The latest partial-government shutdown has been long, and while on reprieve now, may not be laid to rest until a more permanent funding bill is passed by Congress. A shutdown occurs when Congress fails to pass or the President refuses to sign legislation funding federal government operations and agencies. 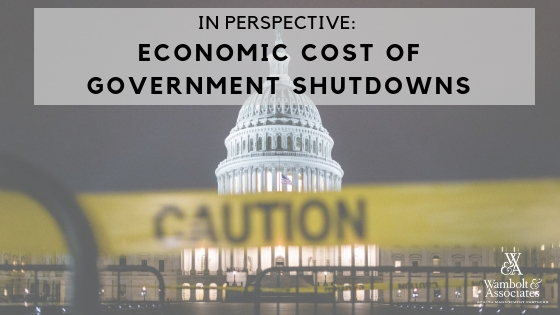 The most recent shutdown occurred Dec. 21, 2018, when lawmakers failed to enact legislation to fund government programs, leading to the longest ever government shutdown. After a 35-day standoff, a temporary funding bill reopened government on Jan. 25 while congressional negotiators attempt to find a deal on border security. Short a long-term funding agreement, the government could shut down again as early as mid-February when the stopgap funding bill is set to expire. The record-setting shutdown is far from the only shutdown. Although voters have little appetite for government shutdowns, holding budget negotiations hostage to push through political agendas is now commonplace in the beltway. 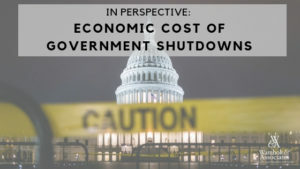 Under almost every president since 1976, shutdowns have impacted government operations and cost varying levels of economic losses well into billions of dollars. Lost wages, exports, and government services essential to the operation of private sector businesses are all affected. Most of the $11 billion in damages to the economy in the latest federal government shutdown will be reversed as federal workers return to their jobs, according to the nonpartisan Congressional Budget Office. However, an estimated $3 billion in economic activity is permanently lost (CNBC). There have been over 20 funding gaps in the federal budget, of which 10 have led to federal employees being furloughed. The length of the shutdowns varied from 1 day in 1981 under President Reagan to a minimum of 35 days in 2018/2019 under President Trump. In the latest shutdown, about 800,000 federal employees in nine Cabinet departments and various smaller agencies were impacted. Some were furloughed without pay while the rest, deemed as “essential”, were required to work without pay. Departments affected during the most recent shut down include Homeland Security, Housing & Urban Development, Commerce, FCC, Coast Guard, FEMA, Interior, Transportation, and the Executive Office of the President. The closures affect numerous private businesses that rely and adhere to regulatory rules imposed by the Federal government, such as mortgage loans and Housing & Urban Development. Several proposals to end government shutdowns for good have been introduced. In the meantime, lawmakers have until mid-February to hash out a funding deal and avert another shutdown. Should Congress remain at an impasse, the U.S. economy will suffer.